The Jousting Life: Arne Koets: Tournament Organizer and Jouster at the "Grand Tournament of Sankt Wendel"
Several of the jousters competing at the “Grand Tournament in Sankt Wendel” were kind enough to take time out of their preparations for the tournament to respond to a few questions I sent them. Despite his insanely busy schedule, Arne Koets was one of the first to respond. Arne has been interested in military history as long as he can remember. At the tender age of 16, he started sword fighting, and in 2000, was one of the founding members of the Stichting Historisch Educatief Initiatief, a foundation promoting education through living history. In 2001, he started riding and rode his first joust in spring 2002. This launched his jousting career, and he was a member of the winning ‘Burgundians’ team in 2003 and 2005 at the prestigious “Sword of Honour Tournament”. 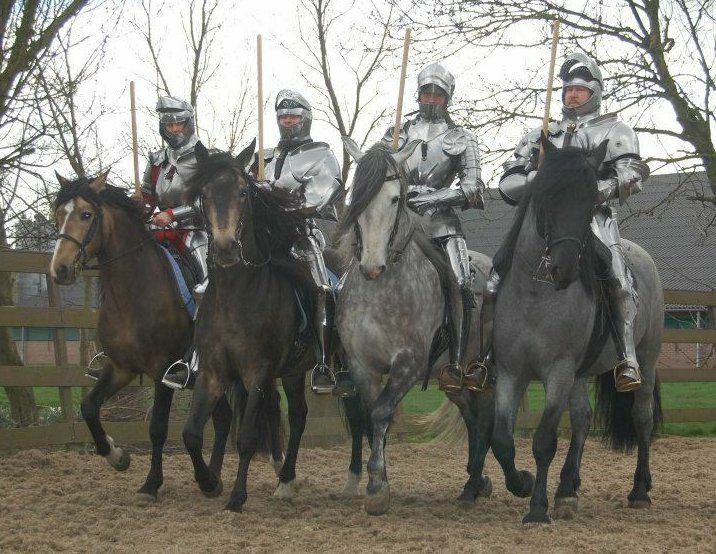 In 2004, he turned full time jouster, and in 2006 moved to the Royal Armouries in Leeds to work as a full time jouster and cavalry display rider. In 2007, he won the ‘Queens Jubilee Horn Trophy’. 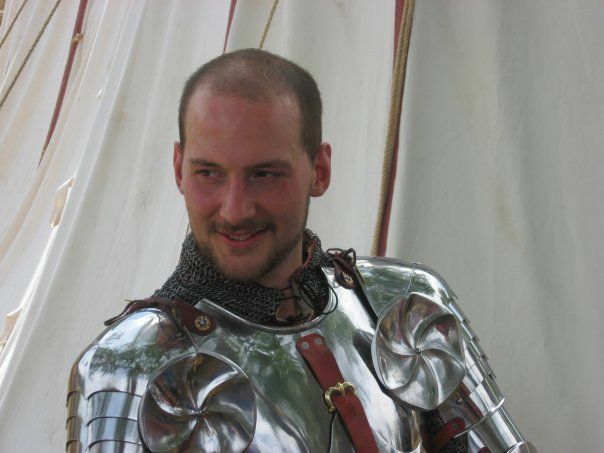 In 2009, he moved back to Holland to work at the Royal Dutch Army Museum as a project manager and continued his work as a jouster, sword fighter and fight choreographer. In 2011, he moved to Germany to work at the Fürstliche Hofreitschule in Bückeburg as the curator for the pre-baroque period, and to join their riding team. He has ridden in over 1500 shows in a dozen countries on three continents in his career. As you will find out in this interview, Arne Koets is not only one of the jousters in the "Grand Tournament of Sankt Wendel", he is also the one in charge of organizing the competition. How did you become involved with the "Grand Tournament of Sankt Wendel"(GTSW)? Arne: I got involved when I organized a set of lectures and a book publishing at the Legermuseum in Delft when I was Project manager for events there. I invited Dr. Tobias Capwell as well as Dr. Alfred Geibig. Afterwards, we had a very nice dinner with all the curators there. The directors really couldn't make it, so it was up to me to entertain the visiting dignitaries and try to keep up with the academic conversation. I seem to have done a good job because they kept asking if I was medieval curator. Anyway, Herr Dr. Geibig had been approached by the city of Sankt Wendel and knew about Tobias Capwell's exploits. Toby, however, suggested I pick up the project due to his personal plans, my proximity, my connections in horse training, etc... So we decided to do it this way: Toby was invited, but I would organize the show. The dinner was around two years ago. I moved to Germany in May 2011, and the dinner was in June, I think. How time flies. I calculated it has taken me at least 5000 hours of dedicated work, and I am not alone. Luke Binks did loads of armouring. I've been hitting 16 hours days for months now. It is exhausting. Arne: I spent two years as an apprentice at the Fürstliche Hofreitschule in Bückeburg, learning to ride and train to a completely different level, with the legerete in mind – the lightness of the aides. I trained side movements, canter pirouettes, canter lead changes, passades and Spanish walk in particular, but also had the huge honour to ride terre a terre, mezair, backwards mezair, even piaffe and passage on the school's stallions. This helped me immensely to develop my 'inner image' of collection. Arne: My horse is called Maximilian. I ride him up to twice a day, at least 6 days a week. I have only had him since August last year. He is still a young boy at 6 years old (only just turned six). We spent a lot of time making a bond. Grooming, and riding of course, but also just hanging out, cuddling, doing exercises on the ground, playing with a large ball, etc... When traveling, he really looks for me for company. Max can be belligerent at times, and has a strong will, but now has become a reliable steed as his performances in Denmark, England and Germany have shown. Arne: Do I get to pick only one thing to be nervous about? Arne: I'm looking forward to doing a real tournament like it used to be: real lances, real armour, real saddles, real horses, and a real melee. I think the melee is going to be very much fun. 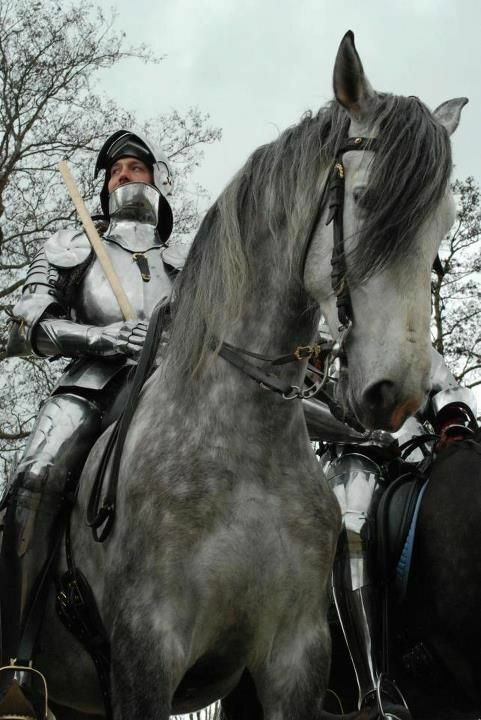 I hope we can show with the horses we have now, at the level they are now, that knightly riding can be so much more. But also how we have only just started to develop in this direction, and how it will change the image of the tactical ability of knights. You can learn more about Arne Koets on his website. You can find out more about the "Grand Tournament of Sankt Wendel" on their website which includes both a German version and an English version.